Strawberries, kale, and rhubarb, oh my! That’s right ladies and gentlemen, it is that time of year again. The first pick up of the CSA season! My roommate Eryn and I have been patiently waiting for this Saturday for months now. Since both being ‘released’ from the fashion world, we have both focused in on our love for cooking. Picking up the CSA share is like participating on an episode of ‘Chopped’. As Forest Gump would say, “You never know what you’re gonna get.” Today started with an early morning 2 mile walk at McCareen Park. We headed over to the CSA to get our share and while walking home, yikes, hunger struck! What to make with our lovely garlic scapes and radish tops? The ideas began to churn and our mouths to salivate. Once we finally reached our apartment, Eryn started to whip up a savory concoction & I was put on smoothie duty. There were 2 pints of organic strawberries in our share that weren’t quite sweet enough to enjoy on their own. So, I decided to make a strawberry banana and almond butter smoothie for energy. Yum, breakfast was delicious and the smoothie was cool and refreshing. Cheers to posting my first recipe, I hope you all enjoy it! Put all of the ingredients into your blender leaving the almond butter for last. you don’t want to put it in first because it might stick to the container and not fully blend into your smoothie. Start on a low setting and as the ingredients start to mix turn up the speed until you reach high power. Keep the blender on high for approximately one minute and then serve. Voila! 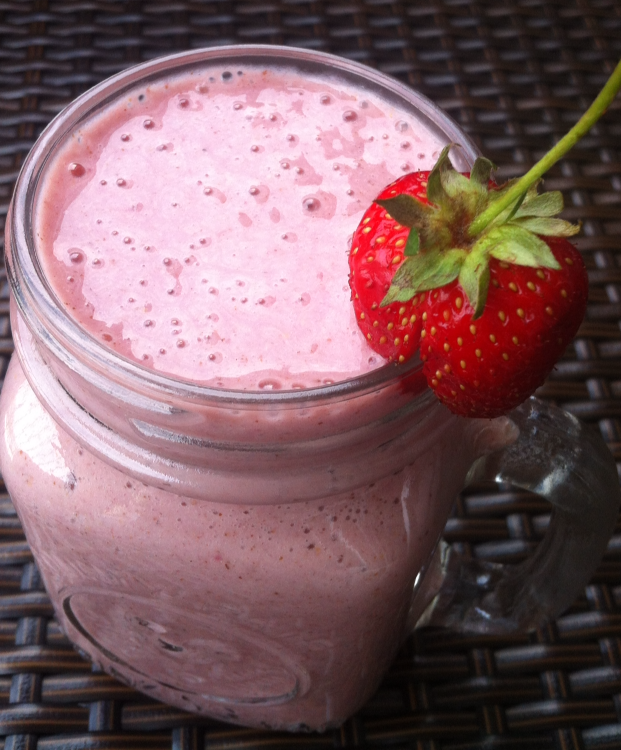 a healthy and delicious smoothie that will help you power though your day. Garnish the glass with a strawberry or banana slice for eye appeal and enjoy! This looks killer! I follow your roommates blog and I am excited to share in your journey as well. Come and link up your delicious smoothie at my CSA link party…http://inherchucks.com/2012/06/06/whats-in-the-box-29/. Hope to see you there! thanks! I added my post to your blog. You have an awesome site. Yum. My favorite thing is to add greens to a smoothie like this. Tastes great and more vitamin goodness. Thanks for your support! I love adding greens to my smoothies. I made a mango, pineapple, coconut, spinach & cilantro green smoothie yesterday. It was amazing. I’ll be sure to post the recipe soon. Stay tuned for many more delicious and healthy recipes. Oh, drool! I love pink food. I am such a girl. Actually, it has nothing to do with being a girl. My grandpa would drink this. And her was in the Airforce!